People are searching online for what you offer. How can you use Google AdWords to show up at the top of the search results and get a positive ROI without breaking the bank? “Small Business Stacey” interviews “Digital Dave” on the success he had with AdWords for a coffee and smoothie business. Welcome everybody to another episode of Where Marketing Meets Technology. Today, I’m on the road with Digital Dave because it’s a crappy weather day here in the D.C. area, you can probably see that through my window. But me and Digital Dave, we’ve got some fun going on today. We are heading out to buy wine, then we’re going to go the mall, then we’re going to do some shopping at Ikea. But you probably don’t care too much about that, what you do care about is what we’re talking about today, which is how you as a small business owner can leverage the power of AdWords. Stacey: And my guess today, Digital Dave, is going to share some great examples of how we’ve been doing that in our coffee and smoothie business. How are you doing Digital Dave? Digital Dave: Doing great Stacey. Happy rainy Sunday. Stacey: Yeah, well, that’s the nice thing about AdWords is that people are always going online to search for things, right? Whatever it is. In our business, it’s tiki bars and coffee and smoothie bars. And so, you want to get found. And running AdWords is a great way to do that. But we hear so many small business owners tell us, “Well, it’s like flushing money down the toilet, right? Because I’m putting a lot of money in but I’m not seeing a lot of money come out.” So what would you tell them? Digital Dave: Well, Stacey, I would say that the first thing you want to do and I’ll just share the example of our coffee and smoothie AdWords account, is that Google made some changes last year towards the end of the year, not just on SEO but I think also the way that they decide on how to most appropriate the ads that are advertising through AdWords. And we noticed that in our coffee and smoothie business that our AdWords account, that we had been running for years and years and years, that was giving great returns, getting great conversion rates, had all of a sudden started to deteriorate. We were paying a very large amount per click (CPC) compared to what we used to and we noticed that our conversions were dropping as well. And so, really what I want to focus on, on this episode is that the lost art of AdWords. I think everybody is kind of given up on AdWords a little bit these days but I’m here to tell you, you shouldn’t. So, after looking at this for a while I was researching it, and I was walking through our AdWords account. I’m looking at everything and I’m really trying to study why did this change? And I noticed some things that we weren’t doing as well as we should that really affected the way that we were getting positioned by Google in our AdWords. And I want to talk a couple minutes about this. Before I do, I want to ask you a question, Stacey. What’s your take on AdWords? Stacey: AdWords, well, it’s kind of I think like a necessary evil. I don’t think it’s a strategy that a small business owner should completely rely upon but you have to understand that people will search online for you. Now, when you were talking about how we were paying a lot per click, let’s get into a little bit more detail about that. We were finding that for a term like smoothie catering, we were paying between six and ten dollars a click. Stacey: Right? That’s just a click. Stacey: If people are just clicking and then bouncing you just lost six to ten dollars. So how long can you afford to do that? Stacey: And that’s why Digital Dave has tools in place that we use for ourselves and our clients to make sure that we are seeing positive ROI. And like you said, Digital Dave, you noticed some trending downward types of things. Now, you know you say, what do I think about it? Well, it’s funny because the rules constantly change. You feel like it’s impossible to keep up with it. I mean as we’re recording this there are some major changes going on with Facebook, talking about that, right? Digital Dave: The privacy, right. Stacey: Yeah, with privacy and even being now able to advertise. They’ve taken away a lot of the API’s and things that you can do. So, you never want to hang all of your marketing, time, effort, and money into just one strategy. I think it’s really important to diversify and Google AdWords should just be a small piece to drive traffic. To get more specific of how we do it in our coffee and smoothie business, I’m actually in the process of writing an article right now for GKIC on generational marketing. And while most people they get that there’re different generations right now, there’s the Baby Boomers and Gen X, and the Millennials, and you may think that, “Oh, well I just need to market to all those groups differently.” We as in our coffee and smoothie business, we actually take a different approach because we don’t want to be everything to everybody. We know who our key avatar is, right, those HR managers in the corporate world. So, in a way that’s a positive thing because it means that we then don’t have to invest in the newest greatest, fastest technology. Relating it back to AdWords we know that some people are still going to go online to search for us and we want to get found. The key thing is that we want to do it in a cost-effective way. So, I’m rambling on, I’m going to turn it back to you. And maybe you can then talk about how do we in our coffee and smoothie business leverage it so that we are seeing positive ROI. So, the first thing we did is we looked at our keywords. And we revamped all of our keyword lists, and we really focused in on our avatar, and we really focused in on more longer tail keywords that we knew from many years of being in the business, that people would search for, like smoothie catering in Maryland, smoothie catering in Bethesda, things that were a little bit more unique that we thought that this bigger player wouldn’t be trying to maximize in their AdWords campaign, so went to a more longer tail approach and looked for things that were more at the point of sale type of things then just smoothie catering. I mean if they’re looking for smoothie catering, yeah maybe they are ready to buy but maybe they’re shopping. So, we came up with a list of keywords. It still includes smoothie catering in that list. And then what we did, which really, really worked for us is we took our campaigns that were within AdWords and we broke the AdWord campaigns up into smaller pieces so that the ad groups, there was one ad group per keyword set. So, it was very specific so that the AdWord group/campaign was very catered … funny, right? Stacey: Yeah, no pun intended. Digital Dave: Very focused towards the keywords that we put in there. And what we did immediately was we went in and we found the list from before from the history of keywords we were getting traffic from that we didn’t want to get traffic from. Things like the word catering, we didn’t want catering, it’s too broad. Party rentals for some reason we would come up under party rentals, we’re not renting smoothie equipment, we’re selling a catering service. So we went and revamped all of our ad groups, our keywords, and now what we’re focused on is reducing and eliminating negative keywords as they come up so that we are only getting traffic for very, very specific keywords that we want. And here’s the great thing Stacey, here’s the great thing, which I think you’ll even be shocked about. I’ve been looking at the statistics of this over the last two or three weeks and our AdWords spend is less than half of what it was before we revamped our campaigns. Stacey: That means more wine. Digital Dave: That means more wine. And the second things is that our conversion rate is way, way better, wait till you hear these numbers. Stacey: How are we doing? Digital Dave: So, as of about three weeks ago our conversions, we had about 36 clicks on our ads and we had 32 conversions. Stacey: 32 out of 36? Digital Dave: 34 out of 36. Digital Dave: Because it was so focused. Stacey: No wonder my phone’s ringing off the hook. Digital Dave: Yeah, and I’m sure that you’re getting a lot of contact us forms and a lot of people reaching out, which is the great thing about revamping a campaign like this. I looked at the AdWords campaign today and it’s actually 42 clicks and 37 conversions. Stacey: 37 out of 42? Digital Dave: Over the last 30 days. This really, really works and this is a lost art that I think people have just lost track of Google. I mean Google is a wonderful place to drive very, very, very precise traffic to your website at the right time when they’re ready to buy, if you do it correctly. Stacey: Yeah. So, I love how you mentioned a few really important points. One is long tail keywords because that’s a great way that small local business owner so you can compete. So instead of being generic, smoothie catering, right? Because what if somebody in North Carolina happens to searching for smoothie catering? You’re paying for that click. So, being uber targeted in who you serve, whether that’s geography, or even getting into the specific types of services. So for us you know we can do Bar Bat Mitzvah catering, wedding catering, backyard party. And I notice how you changed some of the ad groups for our coffee catering. You can use the keyword tool planner to figure out what people search on. And so, while some people may want coffee catering, some people may want a mobile coffee truck or a mobile coffee cart. And so, by having different ad groups like you mentioned it lets you get really specific on the keywords and you’re not wasting money, is that correct? Digital Dave: Stacey, that’s exactly what we did is we really focused in on not only our ads themselves, improve the ads and the ad copy, we made sure that the ads matched the ad groups and the ad groups matched the keywords. So, we took it all the way down from the top level down and I think one of the bigger things that we did that really, really helped is removing the negative keywords. Stacey: Ooh, talk about that. Digital Dave: People forget about this, okay. And that’s where I said that the thing about negative keywords is sometimes those are the most clicked on. When you think about party rentals and we were getting a lot of clicks before for party rentals, we did get some business from it I think but when you look at the volume of the clicks that were going to party rentals and the conversion rate it was a waste of money. So you could take something like that and remove a word from your campaign and actually improve your results for the rest of your keywords and improves your conversion rates and your ROI. And that’s what it’s really all about. Stacey: That’s a great strategy, using the negative keywords because Google actually gives you so much information in their platform. They will tell you what keywords people are searching on and if you see that there’s a term that doesn’t really apply just add it to your negative list, right? Stacey: Well, Dave, any other strategies that a small business owner … what metrics should they look at? A lot of people who come to us are sort of new to AdWords, how can they leverage what they’re doing? Digital Dave: Right, Stacey, that’s a great question, of course, is, how do you get started with AdWords and what are the metrics? Digital Dave: And what I’ll say is that the key metric to any advertising campaign is ROI. Digital Dave: ROI is hard to quantify but let me ask you a question, okay? You tell me. If we got 37 conversions out of 42, tell us or tell your listeners what that can mean in terms of dollars to your catering business. Stacey: Exactly, Dave, because even if we are paying six to ten dollars a click, which through your great marketing we’re now doing half of that, but even if we were paying ten dollars a click, an average catering job for us is well over $600. Digital Dave: Wow, $600, okay. Stacey: So, would you spend six dollars to make $600? Yeah, you would say, wash, lather, rinse, repeat as many times as you can, right? But if you’re spending six dollars to bring in something that’s not converting then yeah, I think that’s where a lot of small business owners are getting frustrated. So, you’re right, it’s absolutely about the ROI. Digital Dave: Stacey thanks for clarifying that. I want to put this in real dollar terms for everybody to understand what this means, just for our coffee and smoothie business. Let’s say that conversion to us means that they’ve contacted us, they’re interested in a catering job, right? Okay. And our average close rate on these types of leads, whether it’s a phone call or whether it’s a contact form, is probably 50-60%, right? Digital Dave: Okay, so let me use 50%. I’m going to do some math here for everybody to understand. If you do this right, how well this can improve your ROI, which is really what it’s about. We received, what? 37, okay out of 42, so let’s take half of 37. What’s half of 37? We’ll just use 18, okay. So, we’re going to get 18 sales at $600 per sale. Digital Dave: Okay, so what is that 10 grand ($10,000)? Stacey: That’s a good amount of money, yeah that’s a lot of money. Digital Dave: That’s 10 grand ($10,000), okay. You know how much these cost us? Stacey: What we’re spending in AdWords? Stacey: I think the most we spend a month is about $500, right? Digital Dave: Our current ad spend is $150. Digital Dave: Yep, so we’re spending $150 to potentially get a $10,000 return (ROI), now that, of course, we gotta go do the work so there’s work involved in that, but my point is that the lost art of AdWords has not disappeared. It is still here people. And one of your strategies depending on the type of business you’re in, you should really highly consider looking at AdWords as a way to drive traffic to your website and to your business. But if you’re going to do it you got to make sure you do it with a strategy in mind, and you gotta make sure you do it with ROI in mind. So, that’s all I got for today Stacey, why don’t we go ahead and wrap this up. Stacey: Those were great tips, Dave. And so, you know I think a good ending way to leave this is that don’t think that just putting money into AdWords that people are going to buy, like literally right from that. And I think another thing to hone in on, you certainly referenced the ROI, which is important but there are also different types of conversions that can be measured within AdWords. So, it may be a call, it may be a click to a website, it could be something like generating a report. So, like Dave said, you want to make sure you map out your strategy and be clear on what you’re measuring so that you can know what those results are. And certainly, if you need any help with any of your marketing the Small Biz Marketing Specialist is here to help. So, thanks for tuning in today. 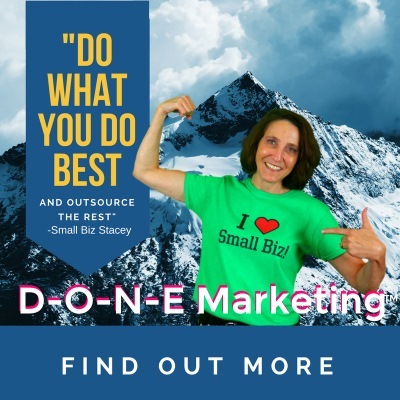 And go on out there, do nice for something, somebody today, but as always make sure you’re working hard to be a Small Biz Marketing Wiz. Bye, everybody. Wow, this is such a great article! More people need to see this kind of content! Thanks for sharing.